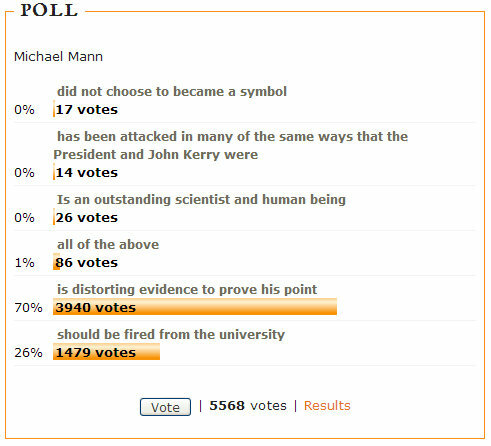 A full year of internet polling has established a 97.3% consensus among 5568 voters at the highly-liberal-warmist website The Daily Kos that Michael Mann is either "distorting evidence to prove his point" or "should be fired from the university." CO2 is a “trace gas” in air, insignificant by definition. It absorbs 1/7th as much IR, heat energy, from sunlight as water vapor which has 80 times as many molecules capturing 560 times as much heat making 99.8% of all "global warming." CO2 does only 0.2% of it. For this we should destroy our economy?